The Qatari property market has witnessed an unprecedented slump this past year. Property demand from expatriates and wealthy holidaymakers has dropped sharply, and house prices and rents have fallen by double-digit figures. In the absence of official house price statistics, it is very difficult to gauge how much house prices have actually dropped. 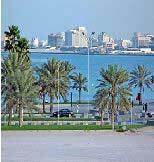 Jones Lang LaSalle estimates that house prices in Qatar have fallen by about 30% in 2009 from a year earlier. Other local realtors claim that house prices plunged by as much as 40% in 2009, while rents crashed by 25% to 30%. Completions of major developments in 2009 brought a surge in high-end residential property supply just as a sharp contraction in demand took place, resulting in crashing prices. Nevertheless, prices are expected to fall another 15% in 2010, as around 10,000 new homes are completed during the year, according to Keith Edwards of The First Investor Asset Management, an investment bank. "We expect 2010 to be the bottom of the market in terms of prices but we don´t necessarily see any upturn in 2011, because of the supply coming in," Edwards said. In 2009, demand in Qatar fell sharply, and both locals and foreign buyers delayed purchases. The property market became dominated by tenants wanting to move to cheaper rental units, or to places offering more amenities, according to The Peninsula, a Qatari English newspaper. Job opportunities for expatriates have been weak, and population growth is expected to slow to 2% this year, after 5.2% annual growth between 2001 and 2005. In 2008, Qatar’s total population was around 1.1 million. Foreigners and expatriate residents account for about three-fourths of the population. 82% of the population lives in Doha and Al Rayyan, according to Qatar Statistics Authority. Qatar’s economy nevertheless remains enormously vibrant. The country is the world´s biggest exporter of liquefied natural gas (LNG). It has more than 15% of the world´s proven gas reserves. It has the third highest GDP per capita in the world, at QAR286,666 (US$78,754). Qatar’s wealth has grown at breakneck speed during the past 15 years, particularly since the Iraq War. Qatar followed Dubai in opening its real estate sector to foreign buyers after the turn of the millennium. A property boom followed. Housing demand was fuelled by increased Qatari purchasing power and by an influx of expatriates, triggering a surge in property prices from mid-2000s to early-2008. As of late-2009, there were about 15,000 unoccupied apartments, according to a report released by Qatar Oman Investment. Very attractive packages are being offered - reduced house prices, free furniture, and introductory rent-free periods. Yet the middle and low-end market is still undersupplied, according to the Samba Financial Group. Qatar issues permanent residence visas to foreigners buying freehold properties, under Law No. 17 of 2004, which permitted foreign freehold property ownership for the first time. Three areas have been set aside for this visas-for-sale scheme: the Pearl-Qatar, West Bay Lagoon and Al Khor Resort. The visa remains valid as long as the foreigner keeps the property in his name. Lusail City is a QAR20 billion (US$5.5 billion) waterfront community on the northern coast of Umm Salal, 15 km north of Doha. It is expected to house over 200,000 residents in 10 hotels, 3,000 villas, 12,000 apartments and retail areas. Developed by Qatari Diar, Lusail will cover an area of around 21 million sq. m. This mega project, in 16 zones, will contain an Energy City costing QAR9.5 billion (US$2.6 billion), and an Entertainment City, costing QAR5.5 billion (US$1.5 billion). Another mixed use development project is Al Waab City, owned by Nasser Bin Khaled Group, which will cover about 1.2 million sq. m.. Incorporating “green strategies” and sustainable design principles, it is expected to cost QAR11.6 billion (US$3.2 billion). Residential rents dropped about 25% during 2009, according to Century 21 Qatar. Rents halved in the Pearl, falling from QAR20,000 (US$5,498) per month, to QAR10,000 (US$2,749) per month. Local real estate analysts are divided on the short-term outlook for the rental market. Century 21 Qatar predicts that residential rents will fall by 15% by mid-2010. In contrast, a study conducted by Global Investment House projects that rents will start to move upward in 2010, as the two-year rent freeze lapses, despite the new supply of apartments. Qatar’s banking sector became troubled amid the global credit crunch. Mortgage lending to expatriates was curtailed by new restrictions, which tested Qatar’s young mortgage market, in which residential property loans were first offered only in 2001. Issued government bonds worth QAR10.9 billion (US$3 billion). There are a total of 15 banks in Qatar. Seven are Qatari-owned, the rest are branches of foreign banks. Interest rates on medium and long-term loans dropped very slightly to 8.59% in September 2009, from 8.94% in December 2008, according to the Central Bank of Qatar. The ever-fortunate Qatari economy, propelled by its massive oil output, grew by an average of 16% p.a. from 2006 to 2008. Then in 2009, real GDP growth slowed to 11%, which resulted in deflation of around 3.5%. This was in contrast to the escalating prices of the past few years. Inflation averaged 13.5% annually from 2006 to 2008. In 2010, the economy is expected to experience 16% GDP growth, with inflation of 4%. The unemployment rate was 0.3% in 2009, but 2.3% among Qatari citizens. From 2003 to 2007, Qatar has had unemployment of about 3% per year, but unemployment dropped sharply to 0.7% during the peak building year of 2008.